I bought so many different kinds of those cuillères (spoons) while in France, which was not really a necessity since they are also available in the US, but my mom shoved them in my suitcase because she said her house is filled with stuff I buy and then I leave at her house, so the closet in my bedroom is filled with kitchen utensils and all kinds of gadgets that I have been accumulated over the years. I am a real pack rat. I still have my own bedroom with clothes and a few teddy bears since my parents still live in the house where I was born and raised (well I was born at the maternity to be clear not in the house), so I guess the “pack-ratting” activity is inevitable. Today I finally decided to use those cuillères. In France, apéro à la cuillère (spoon apéritifs) is quite in fashion and most home cooks and restaurants use them as their favorite ways to serve hors d’oeuvres. Besides I think they’re really elegant on a table, and easy to prepare. They’re seriously ready in a blink of an eye. Enough of savory muffins, quiches, etc… and all those heavy appetizers that make you feel already stuffed before dinner. Those are so quick to make, that it’s not even funny…and incredibly delicious, fresh, zesty and so light. I think you know by now that light is a key word for me, as long as a dish is light and flavorful, send it my way. I bought some mangoes because my new little parrotlet Lilou loves mango, I am trying to discover what fruits and vegetables he likes, and it seems like mangoes, carrots and kale are on the list (wondering if it has to do with the color), so I bought a lot of mangoes, as if he will eat two pounds of mango in a few days. I guess I will have to help him out, and more mango recipes are coming shortly. You can either grill the scallops or sauté them in a pan with a little butter and If you don’t have those spoons, no worries, you can serve two or three scallops in a small plate. Et voilà, aucun problème! First peel mango, cut 2/3 of the mango in small cubes 1/3 inch thick. Place in a bowl. Peel orange, separate the quarters and remove the membrane. Cut a few quarters in small pieces and add to the mango. In another bowl, grate the rest of the mango, add olive oil, vinegar, juice of 1/2 blood orange, orange pieces, cayenne, salt and pepper. Grill or saute scallops in a pan until browned on both sides. 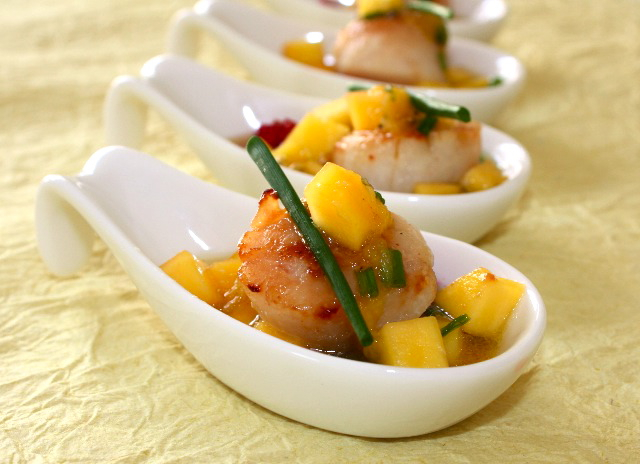 Place a few mango dices and orange pieces in each spoon, add a litte vinaigrette. Add scallops on top, and spoon additional vinaigrette on top. This entry was posted by silvia on February 6, 2010 at 9:57 am, and is filed under Appetizers, Fish/Seafood. Follow any responses to this post through RSS 2.0.You can leave a response or trackback from your own site. That looks beautiful and I bet it taste delicious. I just recently developed love for scallops. These type of presentation is also very fashionable in Spain at the moment, I even got a set of spoons for Christmas, which I haven’t used yet. Wonderful combination, I love scallops. Bright, refreshing and as always…gorgeous! mmmm, you often use my favourite ingredients … scallop amd mango sounds delicious!! Gorgeous please send me some I am salivating oooooooo I love scallops magnificiant color! This presentation is in fashion. I love how you mix scallops and mango together. It must be very refreshing. It’s so elegant, I love it. I can’t tell from the photo, but is it small enough to be an amuse bouche? I really like the cayenne with the mango – in Coney Island I sued to get mangoes covered with hot sauce & salt on a stick. Sounds weird but so good – this is a much more refined way to get that taste I think. I am on a blood orange kick so this fits the bill perfectly to try something new!! this looks lovely. love the idea of the little spoons and the blood orange is a favorite ingredient of mine. Absolutely amazing. I need to buy some scallops pretty soon. Wow. Congrats on Top 9! This is a beautiful dish! Great simplistic dish love it!